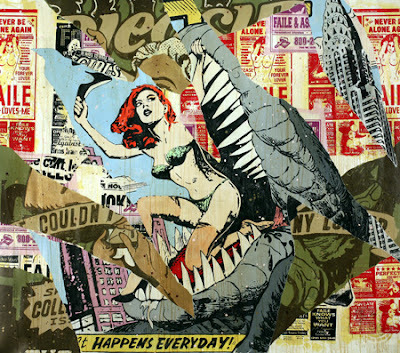 If you have been reading this blog for any length you will know we are big fans of Faile's work. We were delighted last week when we heard that they were having a show here in London. FAILE is an international collective of artists, famed for their striking iconography and unique style of layered and collaged paintings that find their source in pop culture and comic books. They are widely acknowledged as some of the early pioneers in the contemporary street art movement, and since forming in the late 90s, FAILE has since exhibited in galleries across the world, from Tokyo and Shanghai, to Berlin and Copenhagen and all over the USA. From Brooklyn with Love is FAILE’s first solo show in the UK, and follows the success of their exhibits in the group show, Spank The Monkey at Baltic in Gateshead last year..
From Brooklyn With Love will present new sculptures and new largescale paintings including the beautiful ‘It Happens Everyday’, 2007: pictured above, an Acrylic & Silkscreen canvas. The show is taking place at LAZARIDES Gallery, No 8, Greek Street, Soho, London. From Brooklyn With Love will open to the public at 12 noon on Friday 9th March and the show will run until 7 April 2007.
is there a launch party for this? For a show this big I imagine there will be.